A guide to health and disease in reptiles and amphibians in captivity. Artist/Author: Carmel, Brendan and Robert Johnson. 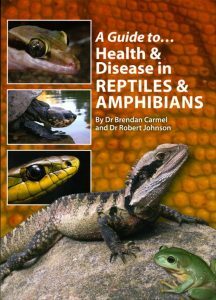 This reference on health and diseases in reptiles and amphibians in captivity is the first published in Australia. Written by practising exotic veterinarians, Dr Brendan Carmel and Dr Robert Johnson, all aspects regarding the captive care of snakes, pythons, lizards, turtles and frogs are presented in simple-to-follow layout. The 240 colour images show examples of typical health problems to assist the herpetologist in recognising signs as well as information about the treatment or action to take to rectify or reduce the spread of disease and support the reptile/amphibian back to good health. The more complete chondro: a comprehensive guide to the care and breeding of the Green tree python. 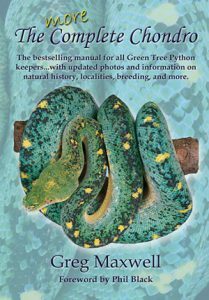 The best sellling manual for all Green tree python keepers with updated photographs and information on natural history, localities, breeding and more. This book, by well-known chondro keeper and breeder Greg Maxwell, is an expanded edition of the original care and breeding manual The complete chondro [stock id 18809]. The 260 colour photographs illustrate both the naturally occurring geographic races as well as all the major designer morphs. Each chapter has been reviewed, revised, and updates. There are over seventy pages of additional information and ninety additional colour photographs in this new edition. This edition also includes major updates to the natural history and locality chapters, time frames for follicle development and ovulation in breeding females, how-to photos for probing chondros, and updates to all the majior high-end colour morph projects. 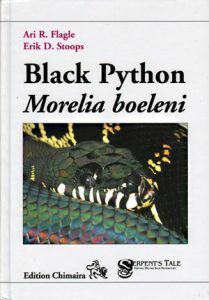 The Black python: Morelia boeleni. Artist/Author: Flagle, Ari R. and Erik D. Stoops. “Ari is a dedicated herpetologist and a driven professional. He has collected information form many people all over the world who have worked in M. boeleni. This book is by far the most comprehensive publication on this species to date. It should serve as a springboard for further investigation and knowledge of the species, I’m sure this book will be an excellent reference for the professional herpetologist, and interesting information for any snake lover.” Joe Abene, Head Animal Keeper, Bronx Zoo.